WRAS receives numerous calls from members of the public concerned about foxes. Limps are one of the most common concerns, however not all limping foxes will need to come in for care. WRAS receives numerous calls from members of the public concerned about foxes. Limps are one of the most common concerns, however not all limping foxes will need to come in for care. Foxes which are able to put weight on the limping leg will normally recover given time and more likely to be just muscular damage. As with humans these can take over six weeks to recover. During this time a fox can be supplementary fed to ensure the animal is getting enough food. However, it is not advisable to continuously feed or you will reduce the foxes territory size and as a result loose control over valuable natural food supplies. Although it is a member of the dog family, some of fox habits are very cat like as well. Foxes are omnivores. They are solitary hunters and eat rodents, insects, worms, fruit, birds, eggs and all other kinds of small animals. About 60 percent of a red fox's diet is made up of rabbits and mice. Like cats, foxes often play with their catch before they kill it. The red fox can reach a speed of 48 km/h (30 mph). The average life span of a fox is 18 months but they can live up to 10 years in the wild. Foxes can hear a watch ticking 40 yards away. The pupils of a fox's eyes are almond-shaped rather than round. Breeding occurs between December and February. Gestation takes 52-53 days. The red fox has 2-5 cubs once a year in spring. Cubs are born naked, blind and helpless. Usually only 2-3 cubs survive. Fox screams often wake and scare people, and the have been incidents where the police have been called out by people thinking a person is being hurt! But they are no more than fox conversations. This is usually only problematic for short periods during autumn, when juveniles are dispersing, and in the breeding season, between Christmas and late February. Studies in the south east of England, have shown that there are around 12% fewer foxes than in 1998. Risk of catching disease from foxes has very limited. Canine rabies, once widespread in the UK, died out naturally in 1906 and has since rapidly receded over most of Europe. Parvo virus and distemper have never been recorded in UK foxes. Doctors routinely warn pregnant women of the dangers of toxoplasmosis, a parasite found in most species of animals including humans and birds. It can in theory, affect the eyes, kidneys, blood, brain and nervous system of any species it infects – no one has ever died as a result and basic hygiene precautions are sufficient to prevent infection. Foxes which are holding a leg off the ground need to be watched closely to see how the leg is being used and how much the leg is moved. Sometimes a leg will be held off the ground whilst running but will be put to the ground whilst it is walking, this is not too much to worry about but you should keep an eye on the leg to ensure it doesn't get worse. Foxes which hold a leg up and the foot or end of the leg dangles out of control and flopping around will probably be a nasty fracture and will need catching. A leg which is held out to the side or an unnatural angle may be dislocated. Observe the injured fox and watch how mobile the fox is. These animals may look very slow when injured but normally they are conserving energy so that when rescuers approach they can use this stored up energy to run off! Dealing with these types of injuries can be extremely difficult and frustrating for the rescuers. Supportive feeding to help keep an injured fox visiting on a regular basis is valuable and helpful in terms of being able to catch the fox. This can then allow rescuers to consider placing a cage trap or look at possible ways of treating a fox using medication provided by sympathetic veterinary surgeons. If you have a limping fox visiting keep an eye on foxes biting the lower section of leg, becoming more lethargic, sitting or walking but unable to do so without staggering or weaving from side to side. Also if the fox collapses to one side in an uncontrollable fashion then please contact WRAS immediately for advice. Foxes can be dangerous to handle and rescuers expect to be bitten at least once a year by foxes who are in pain and frightened. If you find a road casualty park your car where it will help protect the fox from being hit again and turn on your hazard warning lights, however if it is dangerous to stop where the fox is move to a location where it is safer. Call for help as soon as possible. If the fox is in a dangerous location and could cause an accident then call the police using 999 and ask for assistance. If the fox is alert or moving watch it but do not try to catch or hold it, stand well back. If the fox tries to move towards the road and traffic then try to discourage it by standing between the fox and the traffic, but again only do so if it is safe to do so and you are not putting yourself at risk. If the fox is lying on the road and not holding its head up, then cover the animal using a towel or blanket, again keep your distance once the fox is covered and wait for help to arrive. Foxes caught in snares should not be cut free and just released. Call for help as soon as possible. Such calls will be treated as emergency calls. Snares cause ligature wounds and once freed from a snare the toxins which build up below the sometime invisible ligature wounds can used the fox to have a heart attack. These creatures must come in for observation and care for at least 24 hours to ensure the animal is safe and well. Snares around legs can be extremely dangerous as the pressure can cause the top layers of skin to die off and in the worse case scenario the loss of the limb completely. Call for help as soon as possible. Try to cover the animal over with a blanket or large towel but do not get too close or get close to that the animal can bite you. It is more important to try and cover the head than the body but try to cover as much of the body as you can. Once the head is covered the animal will calm down a bit. Do not stand too close to the animal and keep noise down or you will frighten the poor creature. This is fairly common. When a fox jumps over a wire fence, one of the legs sometimes goes the wrong side of the top strand of wire and ends up twisting the wire round the leg trapping the leg in the air where the fox is then left hanging. This needs to be treated the same as a snare injury. When you approach try to get the head covered in order to calm the fox down. This can be more difficult as the fox is hanging rather then lying on the ground. Call for help as soon as possible and rescuers will cut the fox free and take the poor creature in for an assessment of the leg damage and other potential damage to the hips. 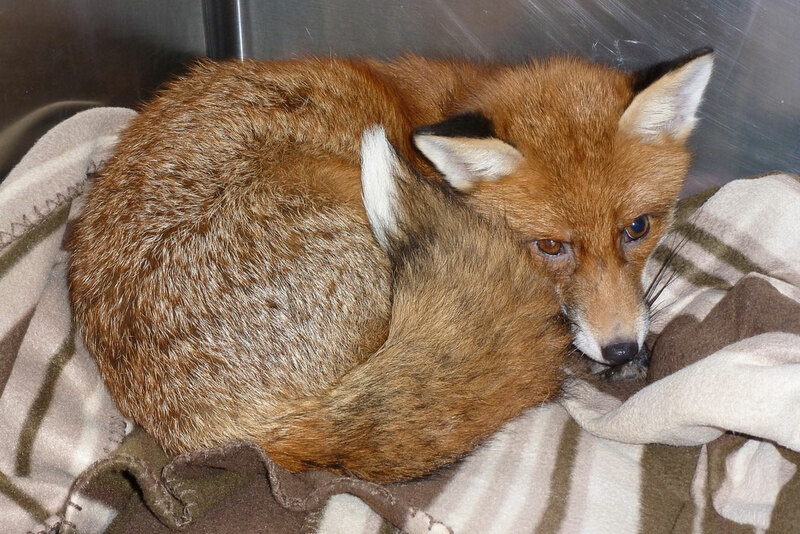 East Sussex WRAS does not remove dead foxes, except where an illegal death is suspected. It is the responsibility of the land/property owner to dispose of a dead foxes if found on their property, however your local council or veterinary centre may be willing to assist with the disposal. If you find a dead fox on the road it should be reported to your the district, borough or city council for disposal as they have an obligation under European law to dispose of dead animals on the road. Fox cubs are often found in gardens, parks and fields where you wouldn’t expect to find them during the daytime. In the spring it is common for vixens to move their young from one den to another. In order to do this they normally carry their young one at a time. If the distance is lengthy, the vixen will use a half way point, depositing her young in tall grass, under shrubs, behind obstacles or similar to hide them. Sometimes this process can take more than one night and therefore the young can be left hidden at the half way point during the daytime. If you find more than one cub in your garden hidden in long grass or bushes then you should leave alone unless they look obviously sick or injured. Even then you should call for help and someone can visit and check they are ok without risking their Mum abandoning them unnecessarily. If you find a cub which is wondering aimlessly round your garden during the daytime or staggering then you should place the cub in a box if it is weak enough for you to catch. Alternatively place a box over the top of the cub trapping it in your garden or leave it alone but keep an eye on it an call for help and advice. If you are not sure then please call and we will attempt to attend and check them. It is possible to re-unite cubs with their mums on some occasions, this involves rescuers sitting up into the night wathcing and monitoring the cubs where they were found. This is not always successful but does frequently work. WRAS does not support the regular feeding of foxes in gardens, due to the problems they can cause as a result. Like all animals, foxes will breed to match a food sourse. The occasional bit of food left out for them is not a problem but feeding large quantities can cause problems. One garden WRAS visited a gentleman was putting out four large bowls of food per night for the foxes. After a few months the foxes visiting the garden had changed from 3 at a time to 9 at a time. Surprisingly the neighbours were not happy at the damage which was being caused by attracting the foxes to this garden. Some neighbours complained and as a result called pet control who started shooting them. If you want to put out scraps occasionally this will not be a problem but limit the amount of food and the frequency in which it is fed. Putting out food infrequently and only in small quantities mean that if the person feeding goes into hospital or dies or moves away the foxes will not starve as a result. To discuss on-site, call-out consultancy services call Fox-a-Gon on 0208 925 9639 or www.fox-a-gon.co.uk who, in addition to household garden work, are specialists in fox proofing large areas such as schools. Humane Urban Wildlife Deterrence carry out small garden service call-outs but are prepared to offer limited verbal advice on 01732 357355 and enquiries@jbryant.co.uk. And for those who prefer a DIY option, Foxolutions stock and provide the most effective deterrents and may be reached on 0844 804 0630 and www.foxolutions.co.uk.